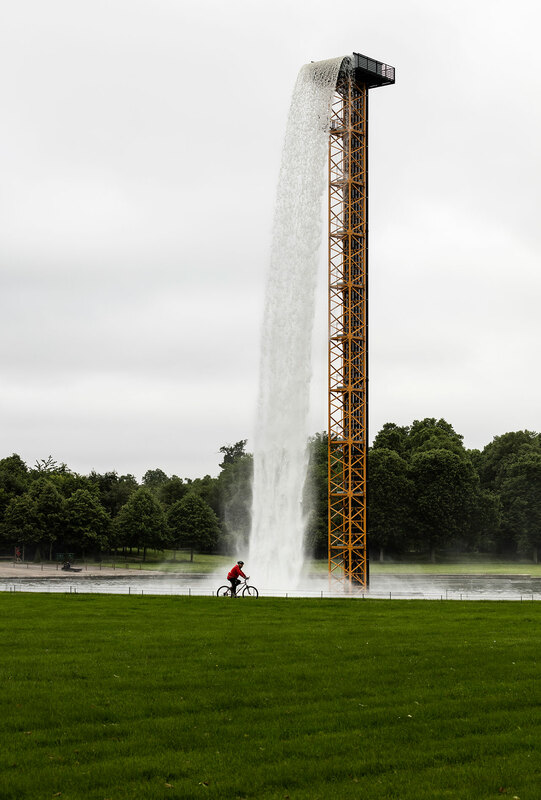 Olafur Eliasson, Waterfall, 2016. Crane, water, stainless steel, pump system, hose, ballast. 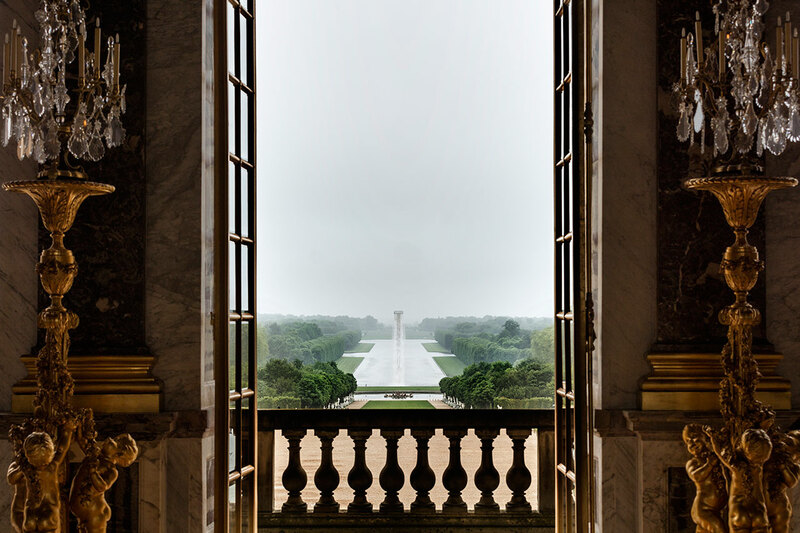 Palace of Versailles, 2016. Photo by Anders Sune Berg. 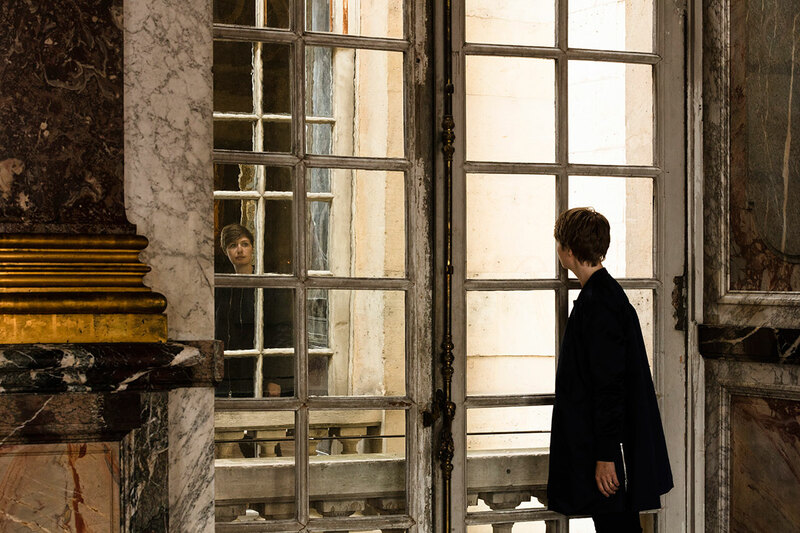 Courtesy the artist; neugerriemschneider, Berlin; Tanya Bonakdar Gallery, New York © Olafur Eliasson. 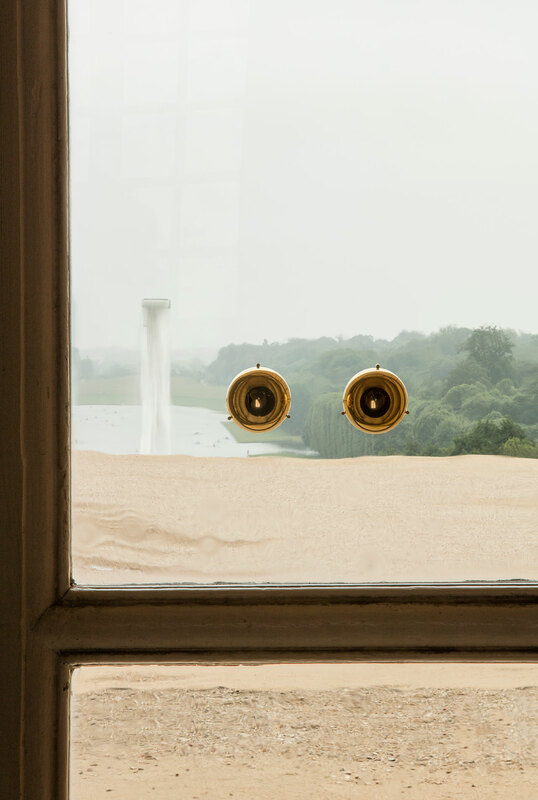 Since 2008 the Palace of Versailles has been organizing an annual exhibition of a major contemporary artist, triggering a fruitful dialogue between the historic surroundings and his or her’s artistic vision. 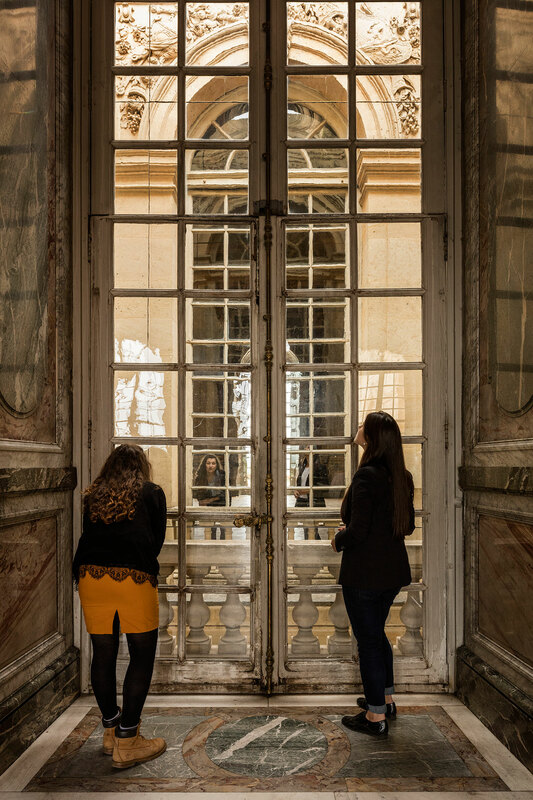 For this year’s show, the Palace has invited Danish-Icelandic artist Olafur Eliasson, giving him free reign to use both the ornately decorated galleries and the grandly landscaped gardens. 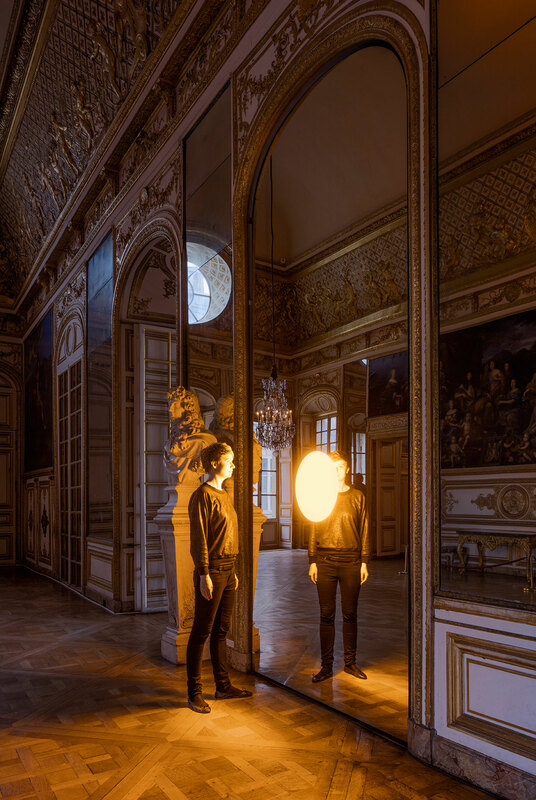 Through several site-specific installations that use intangible mediums such as water, mist, mirrors and lights, Eliasson, no stranger to 17th century baroque palaces— BAROQUE BAROQUE, a major exhibition of his work that ended a few months ago was held in Vienna’s Winter Palace of Prince Eugene—has appropriated Versailles’ original symbolism, the King’s absolute power and unequal magnificence, turning it on its head to create as he says “a place that empowers everyone”. 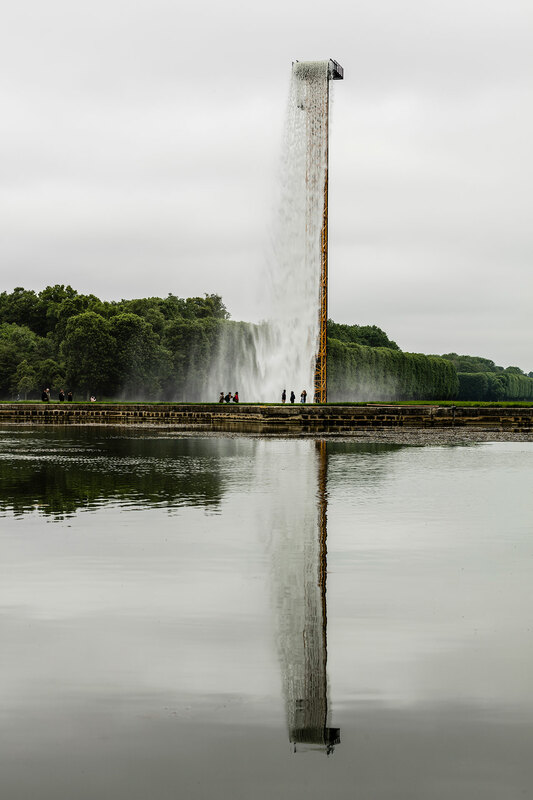 The most impressive installation is by far the monumentally tall “Waterfall” (2016), erected in the Grand Canal, the garden’s central axis, partly as a revival of Louis XIV's landscape architect Andre Le Notre’s unrealized vision of a grand fountain and partly as a tribute to the engineering ingenuity of the past. 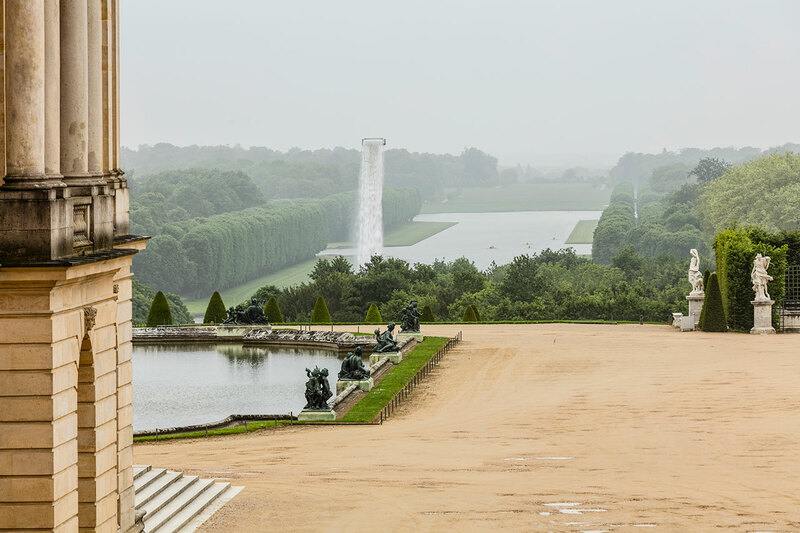 Seen from the palace’s steps, as you approach the garden towering over the sprawling grounds, the water itself seems to be falling from nowhere, as the cascading flow cleverly obscures the slender construction to produce a magical moment of perceptual enchantment. 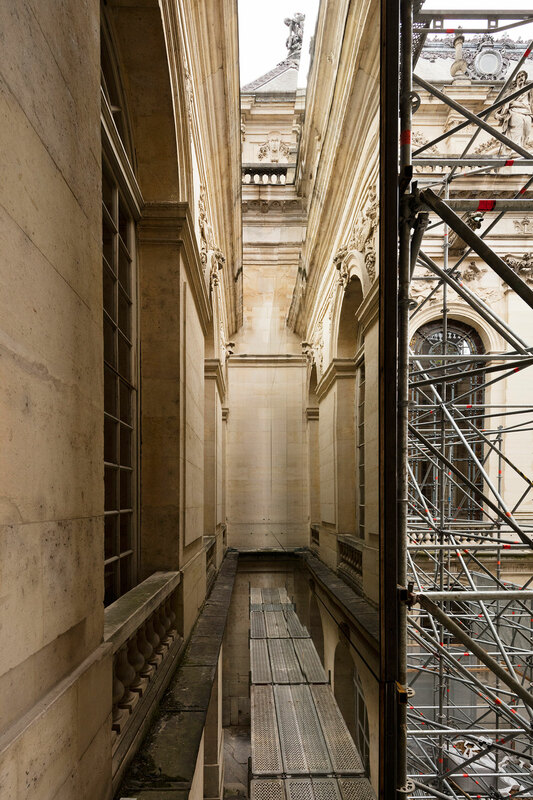 It’s only when you walk around it that the latticed tower, painted yellow and constructed as the rest of the court but left exposed as an act of aesthetic transgression, becomes visible. 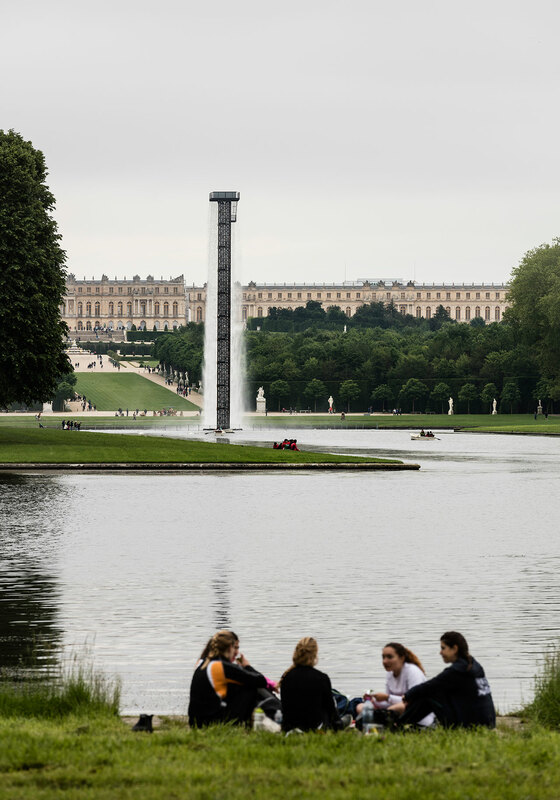 Reminiscent of the artist’s 2008 “New York City Waterfalls”, the installation’s dizzying height is intentionally undisclosed in order to “leave it to the public to make up their own minds how high is high”, the artists explains. 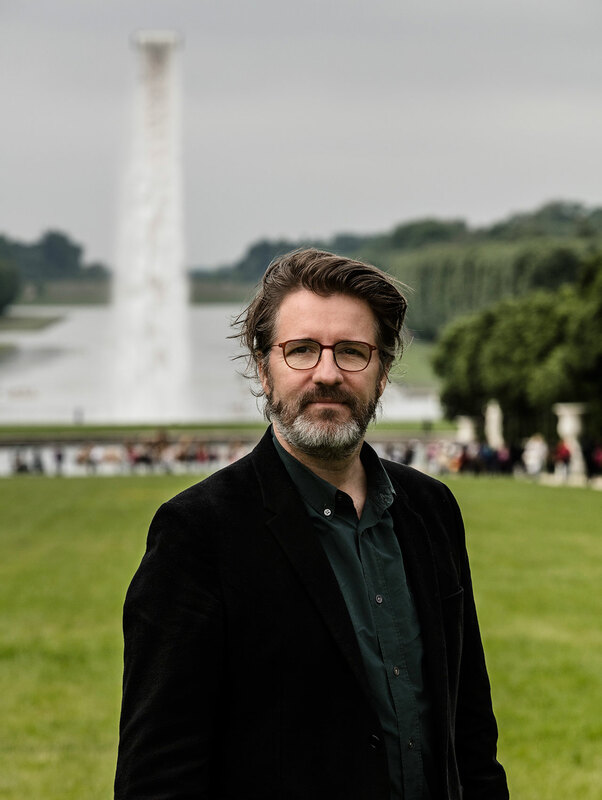 Portrait of Olafur Eliasson. Palace of Versailles, 2016. Photo by Anders Sune Berg © Olafur Eliasson. 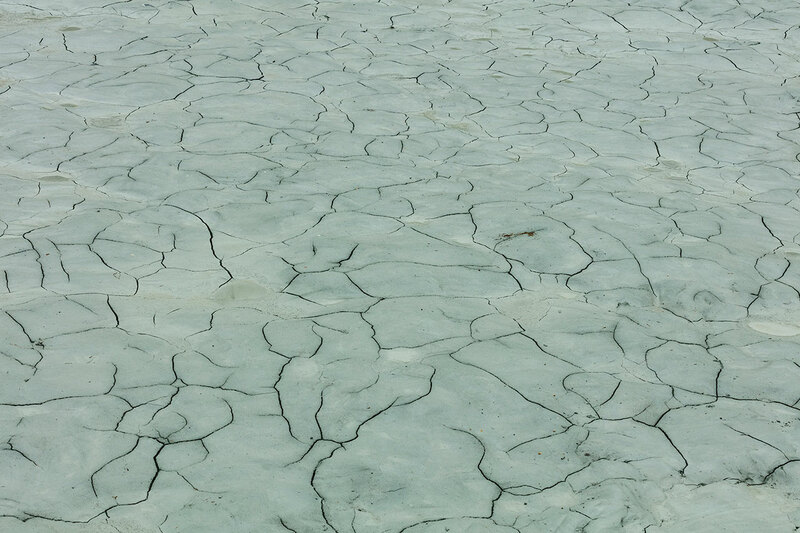 Olafur Eliasson, Glacial rock flour garden, 2016. Glacial rock flour. Palace of Versailles, 2016. Photo by Anders Sune Berg. Courtesy the artist; neugerriemschneider, Berlin; Tanya Bonakdar Gallery, New York © Olafur Eliasson. 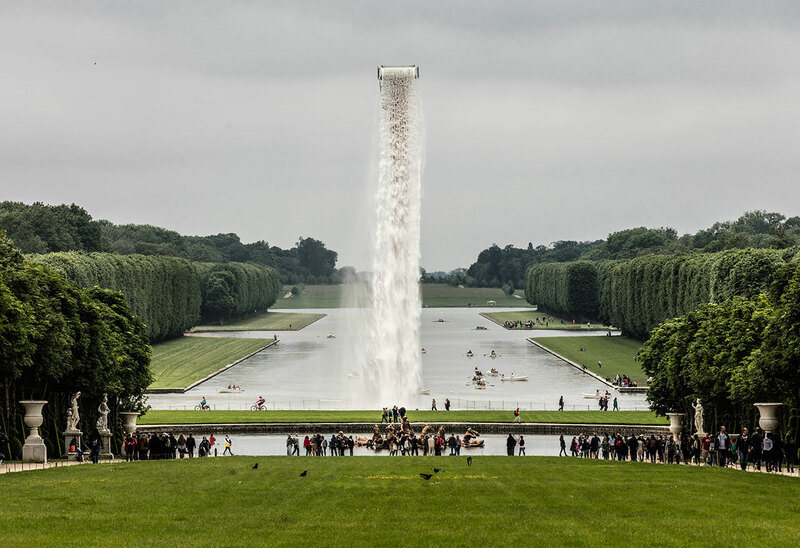 The waterfall is part of a triptych of installations in the palace’s gardens that explore the theme of water, a nod both to its ubiquitous presence in the landscaping of such baroque gardens and to climate change, a subject close to Eliasson’s heart (his most recent installation in France was commissioned last year for the COP21 climate change conference in Paris). 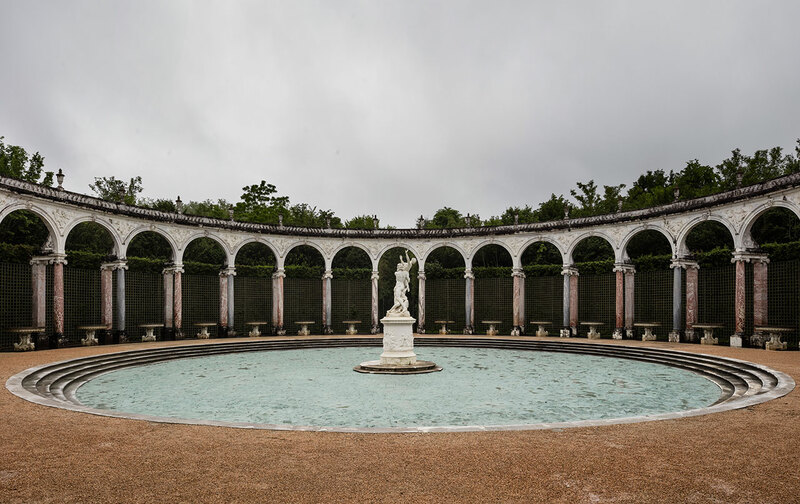 In “Glacial rock flour garden”, the circular centerpiece of the Colonnade Grove is filled with rock residue left by a melting Greenland glacier, creating a glacial carpet that manages to elicit both the feel of parched land and that of cracked ice. 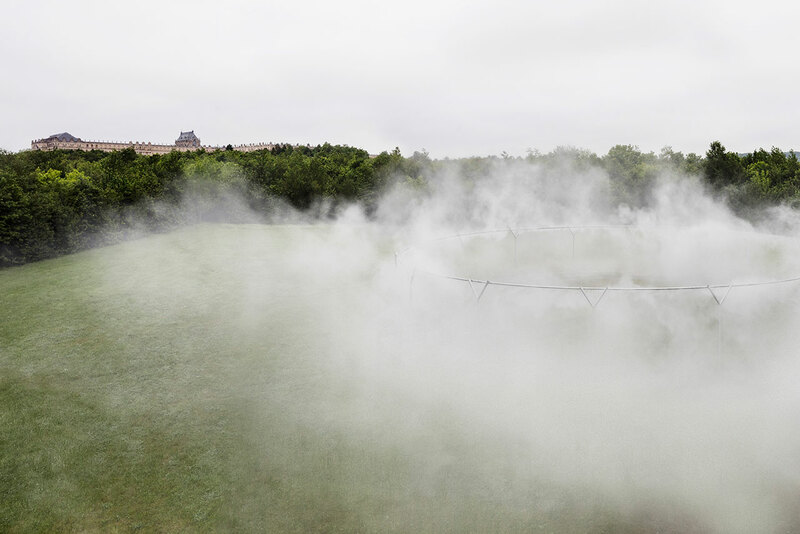 Similarly, “Fog assembly” (2016) in the L’Etoile grove, also uses a circular formation to trick the senses, in this case by enveloping visitors in a nebulous mist in order to “amplify the feelings of impermanence and transformation”. 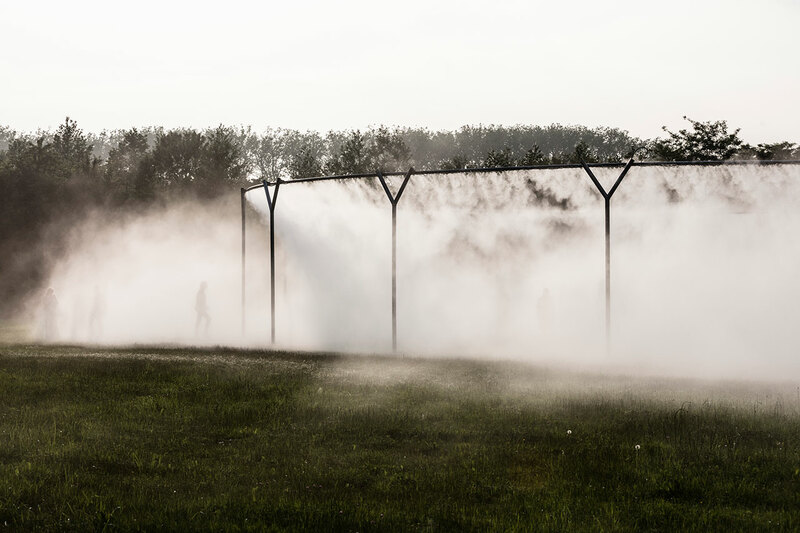 Olafur Eliasson, Fog assembly, 2016. Steel, water, nozzles, pump system. 4.5m ⌀ 29m. Palace of Versailles, 2016. Photo by Anders Sune Berg. Courtesy the artist; neugerriemschneider, Berlin; Tanya Bonakdar Gallery, New York © Olafur Eliasson. 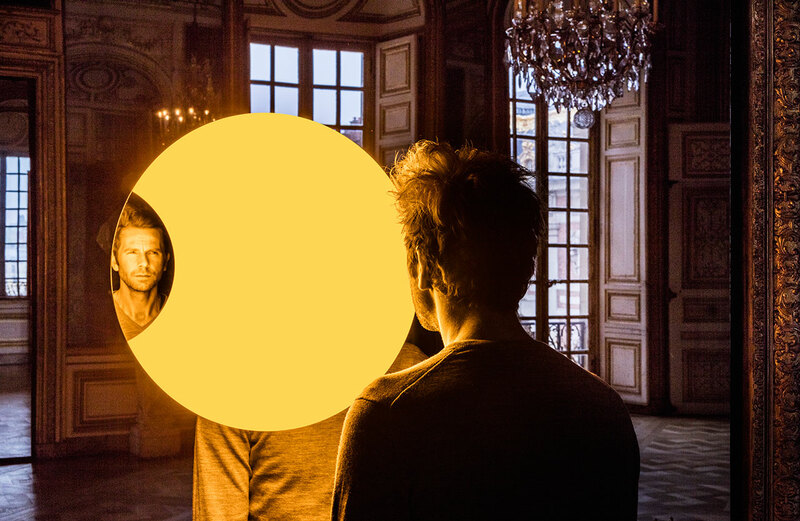 Olafur Eliasson, Deep mirror (yellow) and deep mirror (black), 2016. Mirrors, monofrequency light, aluminium, steel, wood, paint (black, white), control unit. 445 x 180 x 90cm. Palace of Versailles, 2016. Photo by Anders Sune Berg. 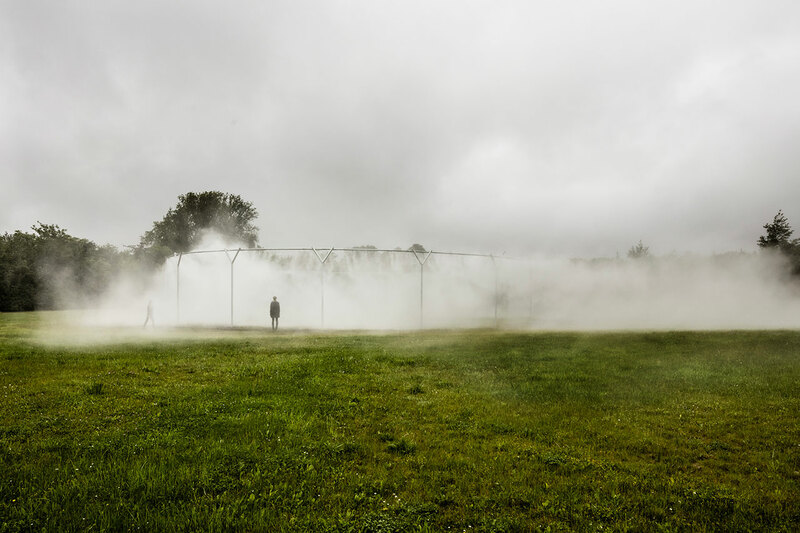 Courtesy the artist; neugerriemschneider, Berlin; Tanya Bonakdar Gallery, New York © Olafur Eliasson. 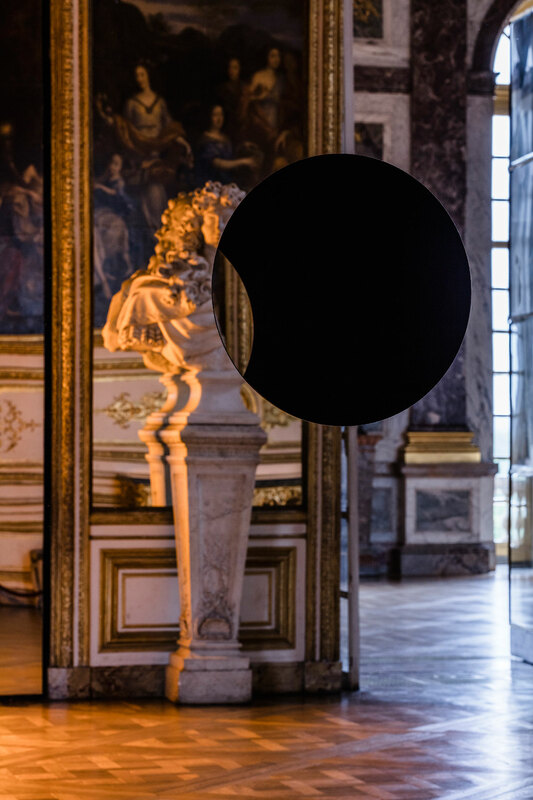 Olafur Eliasson, Deep mirror (black), 2016. Mirrors, alluminium, steel, wood, paint (black). 300 x 141 x 80 cm. Palace of Versailles, 2016. Photo by Anders Sune Berg. Courtesy the artist; neugerriemschneider, Berlin; Tanya Bonakdar Gallery, New York © Olafur Eliasson. 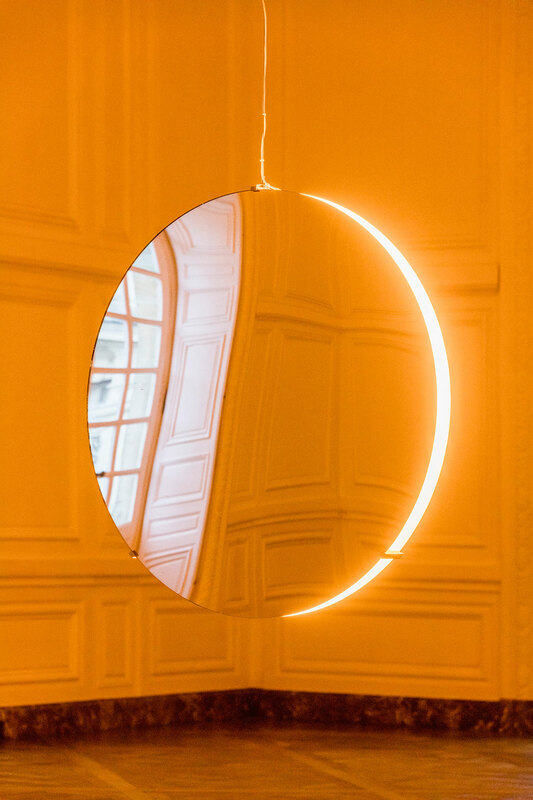 Olafur Eliasson, Deep mirror (yellow), 2016. Mirrors, monofrequency light, aluminium, steel, wood, paint (black, white), control unit. 445 x 180 x 90cm. Palace of Versailles, 2016. Photo by Anders Sune Berg. Courtesy the artist; neugerriemschneider, Berlin; Tanya Bonakdar Gallery, New York © Olafur Eliasson. 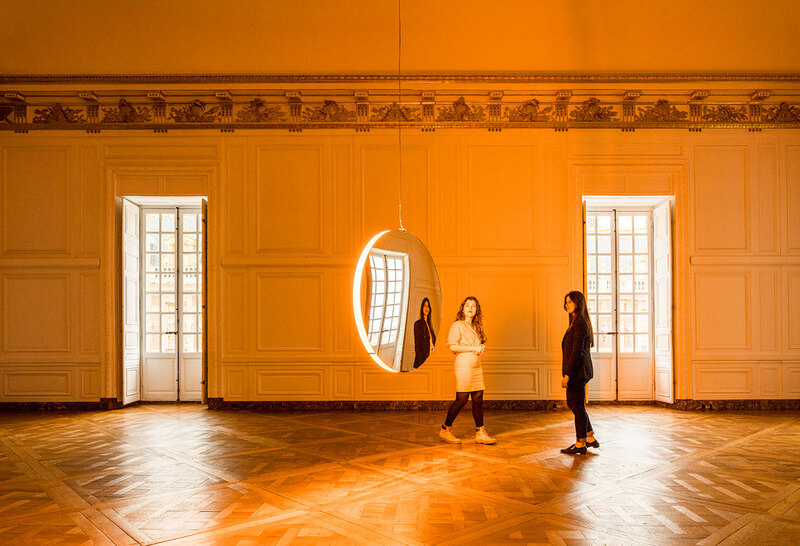 Inside the palace, Eliasson swaps water and fog for mirrors and light, creating subtle interventions, which without actually changing any of the interior décor, encourage visitors to experience the spaces though a constantly shifting perspective. 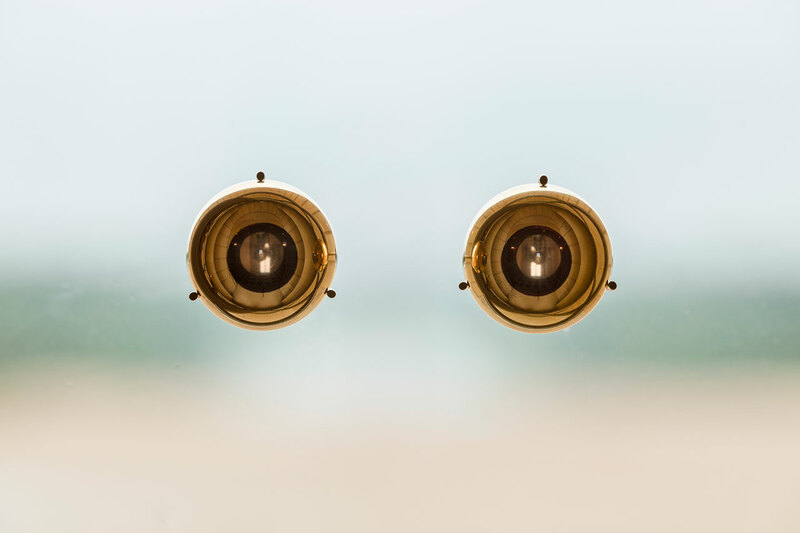 In “The Curious Museum” (2010), Eliasson has ingeniously positioned an enormous mirror directly facing the windows outside one of the galleries, so that the view visitors encounter looking out is in fact the view looking in. 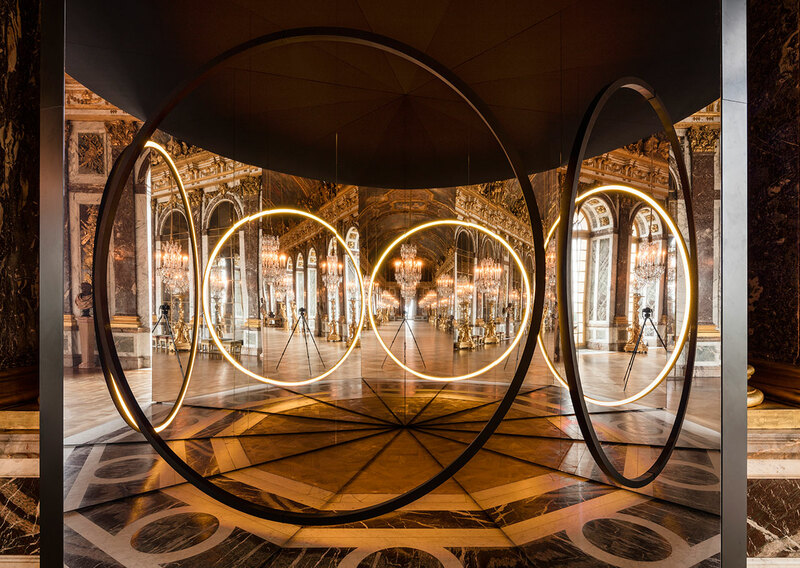 Similarly confounding, “Your sense of unity” (2016), appropriately located in the Hall of Mirrors, features two large mirrors passing diagonally though the doorway and meeting at a narrow angle, which contain a luminous half-circular element, repeatedly reflected to create the illusion of hovering rings of light, whereas in “Solar compression” (2016), a set of circular convex mirrors containing a hidden light source which hang in the middle of another gallery, creates a solar eclipse’s luminous corona that frames the reflected room in unexpected ways. 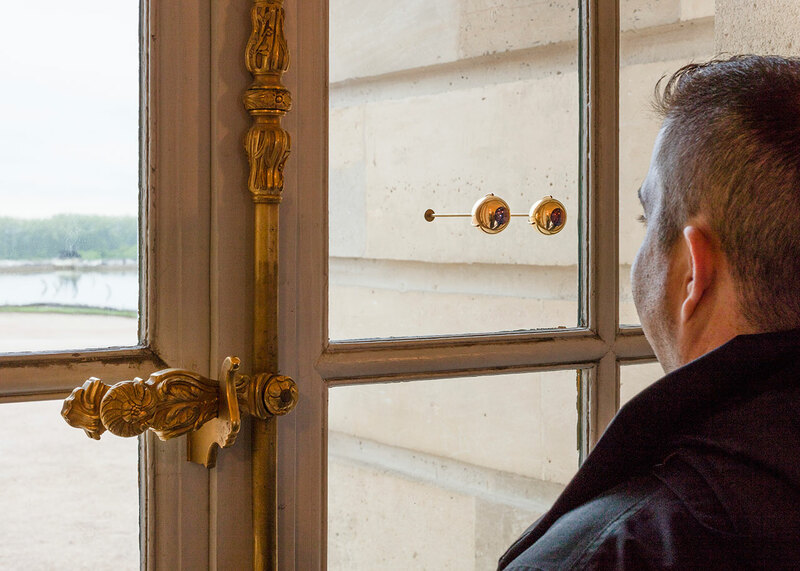 The operative word in these installations is “gaze”—handily represented by “The gaze of Versailles” (2016), a set of gold and brass eye-bulbs fixed on one of the windows overlooking the gardens, directing the gaze of visitors both outwards and inwards—as they are invited “to take control of the authorship of their experience”, to passively consume Versailles’ grandeur and actively re-calibrate it around their own presence, “giving everyone the chance to become a king and queen”. Olafur Eliasson, The curious museum, 2010. Mirror, scaffolding, steel, aluminium. 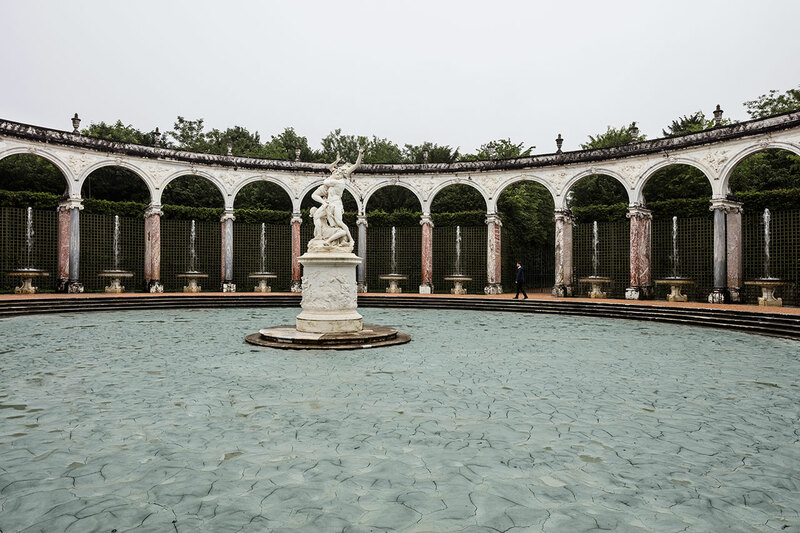 11.20 x 8.50 x 2.80 m . Palace of Versailles, 2016. Photo by Anders Sune Berg. Courtesy the artist; neugerriemschneider, Berlin; Tanya Bonakdar Gallery, New York © Olafur Eliasson. Olafur Eliasson, Your sense of unity, 2016. Mirror foil, brass, LED lights, wood, paint (black), steel, plastic, control unit. 512 x 270 x466 cm. Palace of Versailles, 2016. Photo by Anders Sune Berg. Courtesy the artist; neugerriemschneider, Berlin; Tanya Bonakdar Gallery, New York © Olafur Eliasson. 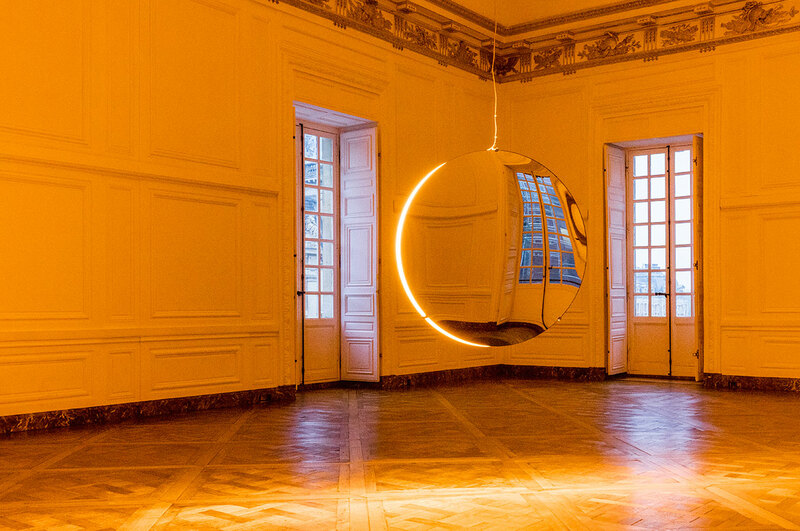 Olafur Eliasson, Solar compression, 2016. Convex mirrors, monofrequency light, stainless steel, paint (white), motor, control unit. 10cm ⌀ 120cm. Palace of Versailles, 2016. Photo by Anders Sune Berg. Courtesy the artist; neugerriemschneider, Berlin; Tanya Bonakdar Gallery, New York © Olafur Eliasson. 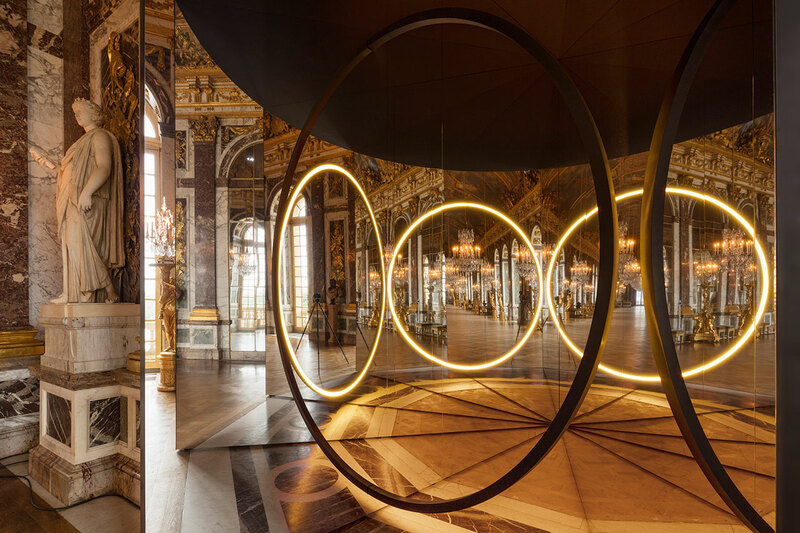 Olafur Eliasson, The gaze of Versailles, 2016. 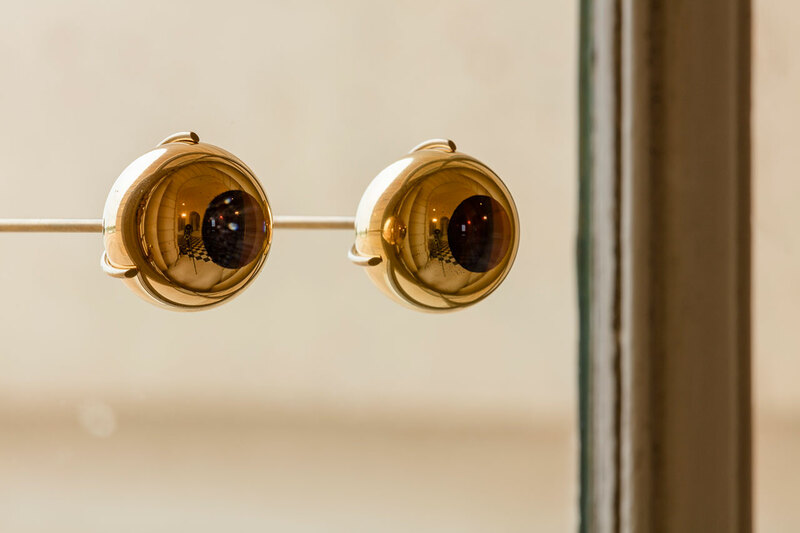 Glass sphere, gold, brass, in two parts. 4 x 11 x 12 cm, each sphere: 3.5 cm. 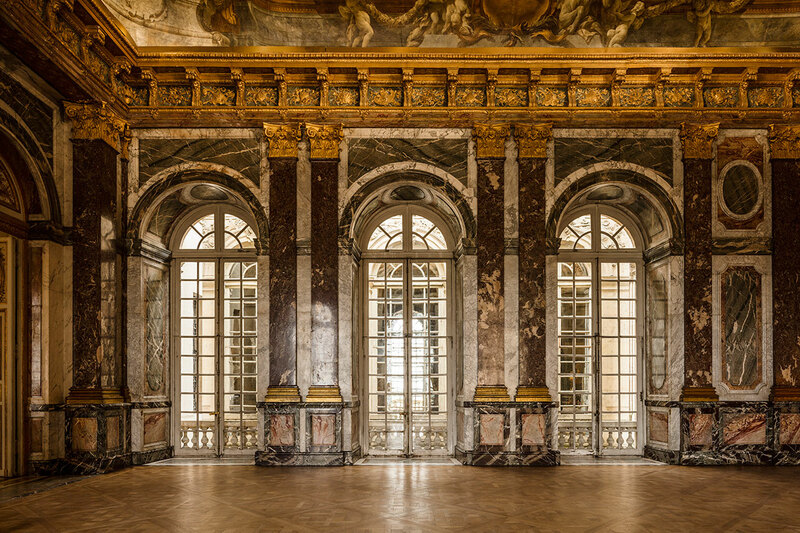 Palace of Versailles, 2016. Photo by Anders Sune Berg. Courtesy the artist; neugerriemschneider, Berlin; Tanya Bonakdar Gallery, New York © Olafur Eliasson.